The phrase “All the colors of the rainbow” is often used to refer to every imaginable color that you can see. What is interesting is that almost the exact opposite is true: With the exception of the rainbow itself, you almost never see the colors of the rainbow in nature, and indeed almost all of the colors that you do see are NOT in the rainbow. Look closely at the rainbow spectrum above. Try to find Pink. Or Brown. Or Teal. Or Chartreuse, Mauve, Vermillion, etc etc… You won’t and you can’t. So what’s going on? 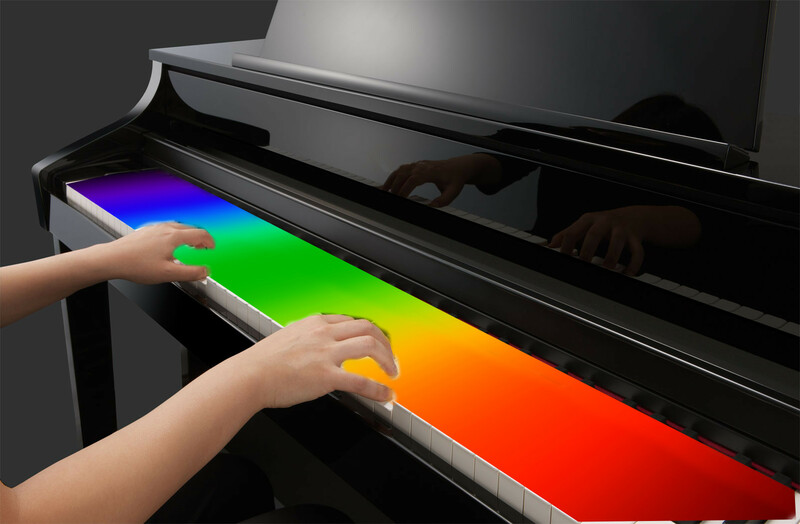 So the idea is, each color in the rainbow is just a single (very thin) key, a single note on the piano, and as you run your finger along the piano, playing a glissando, you are really just playing just one note at a time. But in our world, the colors that we see are each a chord, made up of many of these keys played together. You will need a lot of fingers, and a hand-reach far beyond that of even Rachmaninov, covering the entire piano for some colors. Just to explore this piano metaphor a bit further, we should note that light is a wave just like sound, and has specific frequencies and wavelengths. But one difference is that we can hear a very wide range of frequencies of sound, across roughly ten octaves. Since the speed of sound and light are so different, let’s put it in terms of wavelengths. Each octave is half the wavelength of the previous one, and so for sound the range of wavelengths goes from 17 meters (low pitch 20 Hertz) to 1.7 cm (20,000 Hertz). The standard piano covers about seven of those musical octaves. By comparison, the wavelengths of light we can see go from deep red, about 700 nanometers (billionths of a meter), to deep violet, about 400 nanometers. In other words, the color/light piano usable to humans is just short of covering a single octave of light. Not much opportunity for harmonizing, although some shades of violet could be a perfect fifth above deep red. So where are all of our more familiar colors located? Some of them are fairly complicated chords. For example, you might play a RED note loudly, a GREEN note softer, and a BLUE note just a bit more strongly … and if you did, the name of that chord is — guess what? — PINK. We could even shorten this musical notation by saying (R,G,B) = (255, 192, 203). Now you may think that I just made up those particular numbers, but in fact if you check with Wikipedia, the internet standard for color on computer displays has exactly these three values for the color pink. So, the take-away from this first part of my blog is that the universe of color is much larger than the single keys on the rainbow piano. You’ve got to play chords. But even then it gets complicated, and more interesting, which we’ll see in part two, “Yellow is An Idea“.